A strong magnitude 6.3 earthquake has hit 40 kilometers off the New Zealand town of Kaikoura, GeoNet reported. Witnesses described feeling tremors all across central regions of the country. The earthquake was clearly felt in the cities of Wellington and Christchurch. 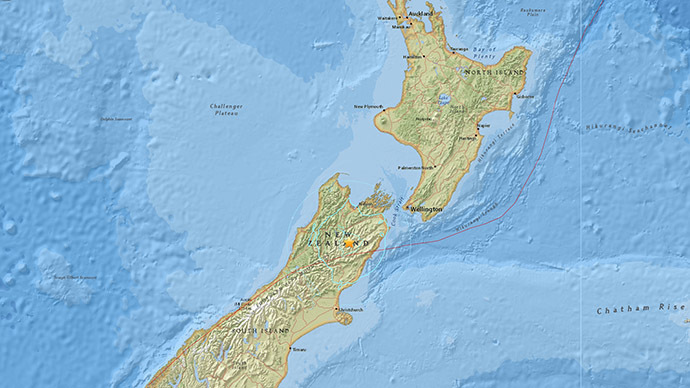 The quake centered in Nelson region at the depth of 80 kilometers, according to GeoNet. The US Geological Survey, meanwhile, reported a lower magnitude of 5.9 at the epicenter. There were no immediate reports of any major damage caused by the quake; however, local public transport services were temporarily halted. The power of the earthquake’s tremors knocked food items from their shelves in the stores and set off alarms. Locals reported that the temblor lasted longer than usual, forcing houses to creak, which caused some people to panic. “We've classed it as a strong quake so a small amount of structural damage, but more likely things falling off shelves and that sort of thing,” she said. Little warned that some aftershocks are to be expected. “The general rule of thumb with aftershocks is they'll be up to one magnitude less than the main shock, so we might have some fives and fours and threes as well,” she said. “Well, initially, we were up on the second floor and felt a slight movement, we thought, 'that's okay, that's it,' so we just took our seats, then it came on - to me, it was a rolling motion, quite firm, quite solid,” Kaikoura's mayor, Winston Gray, told Radio New Zealand News, adding that there were some reports of minor damage throughout the city.